Today’s discussion will be on Polycom and how to upload the latest Firmware. For some of you this will be a repetitive read, if you have done this before, but for those just starting out in the industry, or just wanting to learn some new information on VoIP, then this is for you. It will just take a little time, some elbow grease and some hardware. 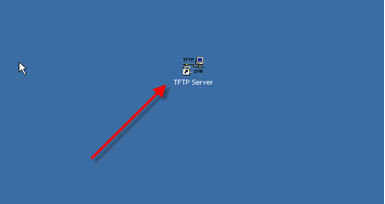 To start this off let’s begin with the brains behind it all: the TFTP server, also known as, Trivial FTP server. You can find tons of programs like this on the internet but the one that we use in our house is SolarWinds. Then enter all the required information and then click “Download Software”. Choose which method of download you prefer and install the software on your local Windows-based machine. Next, you will want to download the Polycom Firmware and Bootrom Files from the VoIP Supply FTP website. If you don’t have credentials, and you bought the end point from us, then give us a call or shoot us an email and we will be glad to grant you access. Below is a picture of the site. Scroll down and you will find PDF files, BootRom Files and Firmware Release ZIP files. Create a folder called TFTP-Root and place it on your C: Drive. Place the “Polycom Firmware Folder” inside the TFTP-Root Folder. Go back to your TFTP Application which should be open on your desktop. Now for the Polycom Phone fun! 1. Plug in your Polycom IP Phone and press the SETUP button to stop the auto-boot process when prompted. 3. Scroll down to the server menu and select. 5. Edit the server address to the “IP Address of TFTP Server” (In my case 192.168.1.97) noted in the above screenshot. 6. Exit the server menu, and then exit the setup menu. 7. The phone will prompt you to save and reboot, select OK.
8. Upon reboot, the phone will go through its auto-boot process again, and then display Uploading Bootrom on the screen. 9. You will also see verification on the TFTP Server as the bootrom and firmware files are being uploaded to the phone. 10. When the phone completes its boot cycle, it will briefly display a welcome screen, which shows the current firmware version loaded. 11. If you see this version, you have successfully upgraded your polycom phone. 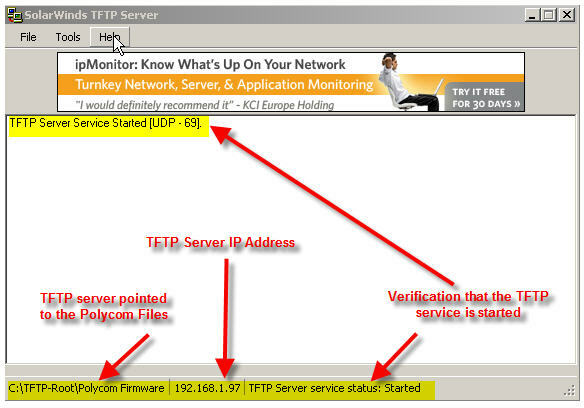 The Polycom Phone that you are upgrading must be on the same network as your TFTP server application (IE. TFTP Server address: 192.168.1.97, Polycom Phone address: 192.168.1.99). This is essential for the phone and the TFTP server to communicate with each other. This process can be done on multiple Polycom units at the same time; there is no need to do one at a time if you have multiple units to upgrade. In order to perform a correct upgrade with files with Polycom Factory Default settings, DO NOT MODIFY ANY FILES. Good post! I’ve done this myself many times. I too thought that TFTP had to be on the same subnet, and was not routeable. However, a couple of people who ought to know have corrected me on this recently. Are we sure that they absolutely must be on the same subnet? Of course, when provisioning phones remotely you’d use FTP or HTTP over TFTP. TFTP – You can use IP HELPER to get across a router. It’s much easier to bring the phone over to your physical network and then update it, versus getting network engineers to update routers – or carry your laptop to the network in need…. Many people run these devices on different VLANs – which can be preconfigured on the unit, and you will not ever find your device simply because it woke up on VLAN2 when you are on VLAN1. I have been trying to use your method to upload firmaware on Polycom SountPoint IP 501 but it has been unable to find MACaddress.cfg… Can someone please help? What should I do? i have a little problem… i hope that you can help me. i follow all the steps to send the firmware, but t doens’t do anything. other thing.. in the TFTP server ip address i get “any” instead of an ip (numeric). i think thats why it doesn’t work. can anyone help me out ? I tried calling Polycom and was referred to the reseller of the device or else they are gonna charge me. However I called my provider and was able to update it by using an ftp server. I have to upgrade our Polycom Soundstation IP3000 unit. Didn’t found anything on Polycom’s website. Is there a way to obtain those files? I have 10 Polycom 501SIP phones which have never been used. I was told that the firmware had to be updated before they could be used. Is there a cost to update the firmware using the procedures listed above? If you use an open source FTP file server and you’re installing this yourself, there should be no cost. This is a publicly accessible server intended only for use of provisioning, upgrading, or downgrading the software of Polycom IP phones with stock Polycom software and configuration files. Multiple ‘stock’ directories exist with different versions of SIP, UC, and BootROM software, and are named according to the SIP or UC software version contained within. These directories are completely stock; no changes should be made to any configuration files within. Each directory contains an ABOUT.TXT to indicate which SIP and BootROM software versions exist within that directory. 1. From the phone’s local menu interface, press Menu > Settings > Advanced (default password: 456) > Administration Settings > Network Configuration > Server Menu. 4. Unless otherwise instructed by VoIP Support, do not change Server User or Password. (Optional): Specify a directory for the SIP or UC software version you wish the phone to provision, as listed below. IMPORTANT NOTE: Using this server to provision your phone will erase all preferences and will restore all settings to their Factory Default Values! ALL SETTINGS WILL BE LOST!! Please click here for a current list of available software directories.